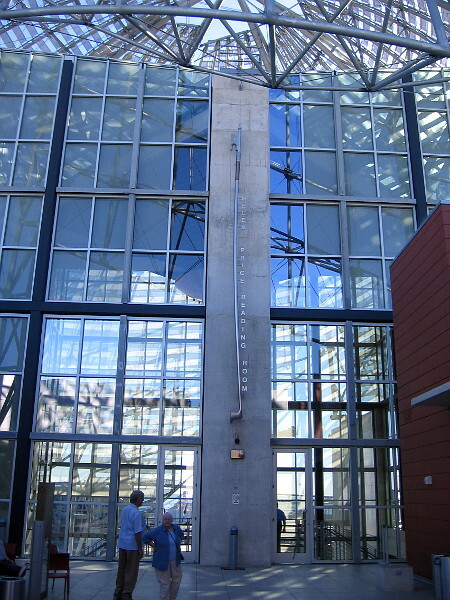 math – Cool San Diego Sights! Unfolding Humanity appears at Maker Faire! 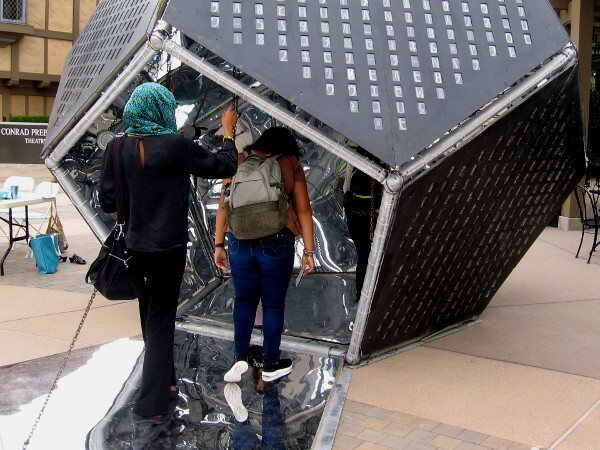 A couple months ago I blogged about the debut of a fascinating dodecahedron sculpture called Unfolding Humanity. 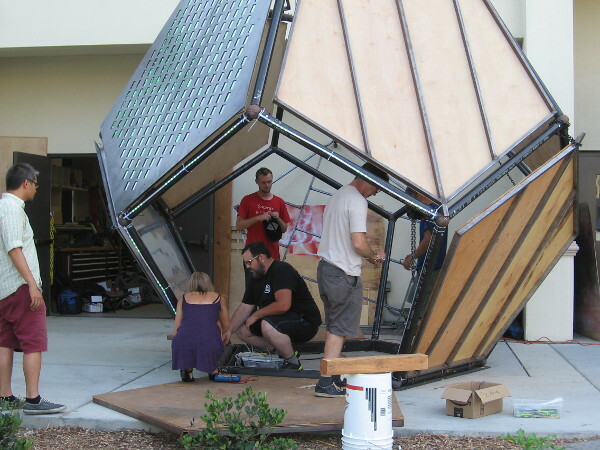 The San Diego Geometry Lab had begun building their project by a parking lot at University of San Diego. Today I finally saw the interactive metal sculpture completed! It was among the many cool inventions on display at 2018 Maker Faire San Diego in Balboa Park! If you want to learn more about Unfolding Humanity–the mathematics behind it, and how it’s symmetry and complexity is similar to the structure of the universe–please check out my earlier blog post here, or visit the artwork’s extremely interesting website here. I learned from Diane Hoffoss, Associate Professor of Mathematics at USD, that the San Diego Geometry Lab might be building additional similar projects in the future. Probably every other year. Because it’s quite an undertaking! I also learned that many people enjoyed stepping inside Unfolding Humanity during Burning Man! Someone even performed magic tricks inside it! 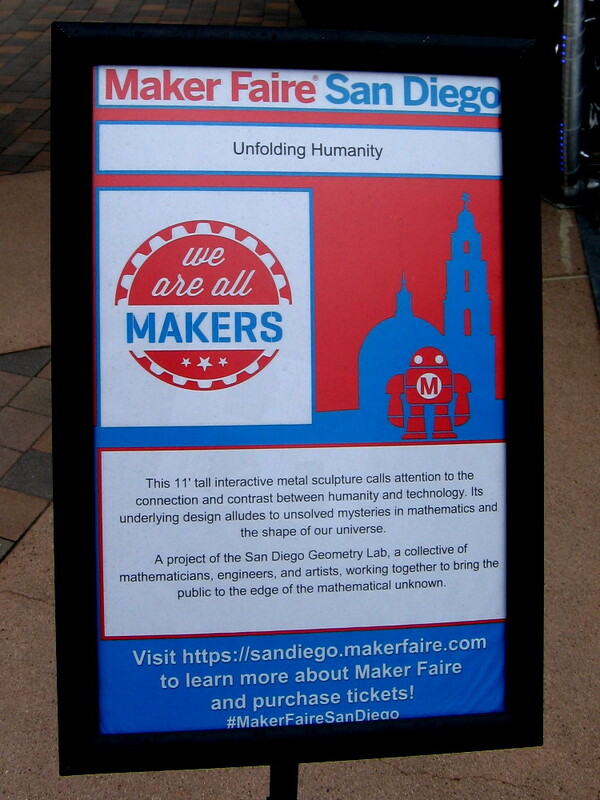 Posted on October 6, 2018 Tags art, balboa park, complexity, cool, education, inventions, math, photography, public art, reflection, san diego, science, sculpture, usd2 Comments on Unfolding Humanity appears at Maker Faire! Assembling a beautiful mystery: Unfolding Humanity. Working to complete Unfolding Humanity. Lit green lettering on the exterior of the sculpture is similar to that from the movie The Matrix. Late today I swung by the University of San Diego to see something extraordinary. 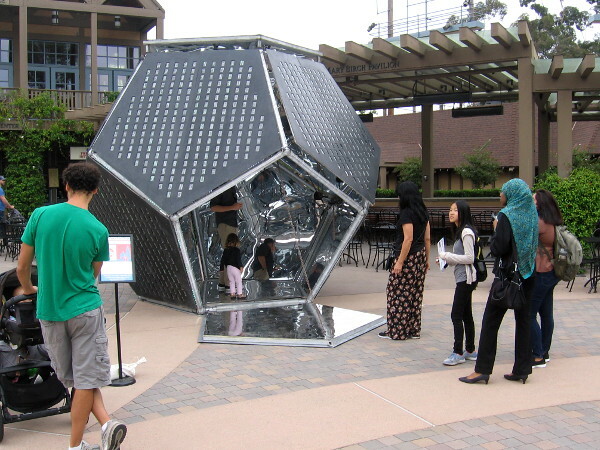 The San Diego Geometry Lab, with the help of the San Diego Collaborative Arts Project (SDCAP) and the University of San Diego (USD) Applied Mathematics program, is building a complex interactive sculpture called Unfolding Humanity. For a few minutes I admired the metal sculpture which stood outside by a campus parking lot, and watched as USD students and faculty worked to carefully assemble it. Unfolding Humanity will be on public display this year during Burning Man, and the weekend of Maker Faire San Diego in Balboa Park. 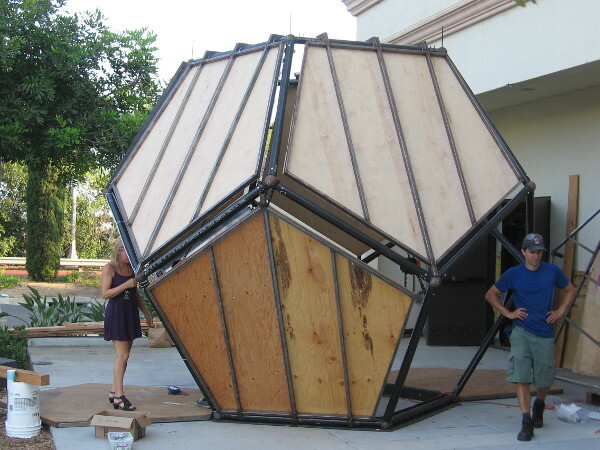 Once completed, people will be able to stand inside the hollow, 12 foot tall dodecahedron. When the mirrored sides fold close, those inside will see their myriad reflections amid thousands of programmable star-like LEDs. They will seem to stand at the center of the universe. The fantastic effect will almost certainly inspire awe and provoke thought. Awe at the beautiful symmetry and complexity of the universe, and thought about its mathematical structure and our place inside it. This very cool sculpture is fascinating on various levels. 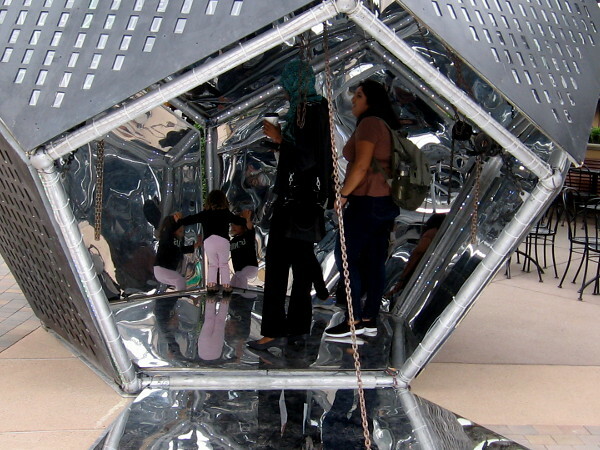 The Matrix-like chamber provokes questions about the relationship between technology and humanity. 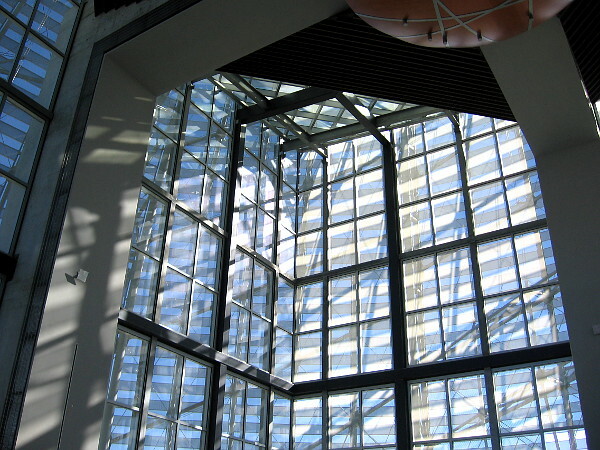 The opening pentagonal walls relate to Albrecht Dürer’s 500-year-old mathematical problem concerning the unfolding of polyhedra. Most interesting to me, the mathematical structure of the universe, based on observations of cosmic radiation, is thought to resemble that of a dodecahedron–the shape of Unfolding Humanity. 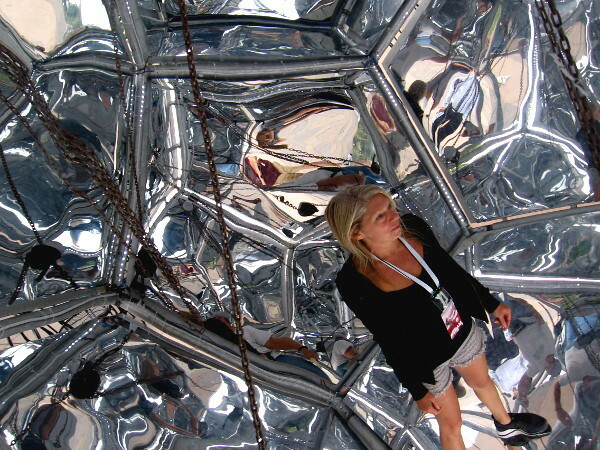 Standing inside the sculpture might in some way help us sense the mysterious structure of the cosmos itself. This artwork reminds us all that the universe’s existence, and our existence inside it, is ultimately a profound mystery. As the Unfolding Humanity website states: We human beings do not know who we are, and that is who we are. Today when I attended Unfolding Humanity’s announced debut, I was under the impression the project was completed. But it turns out construction is ongoing. I learned the interactive sculpture should be finished in perhaps a week or so. Please visit the San Diego Geometry Lab website. You’ll learn more about the artwork’s conception, historical significance and symbolism. You’ll see cool external and internal renderings of Unfolding Humanity based on a computer model, plus an animation of how it will open and close once completed! 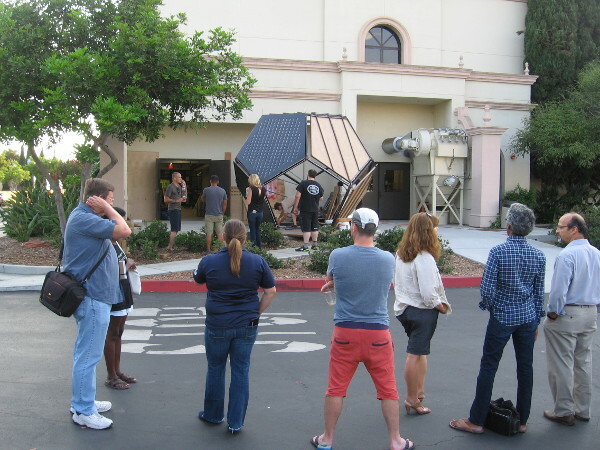 Students, faculty and interested visitors watch work being done on Unfolding Humanity during its debut at University of San Diego. 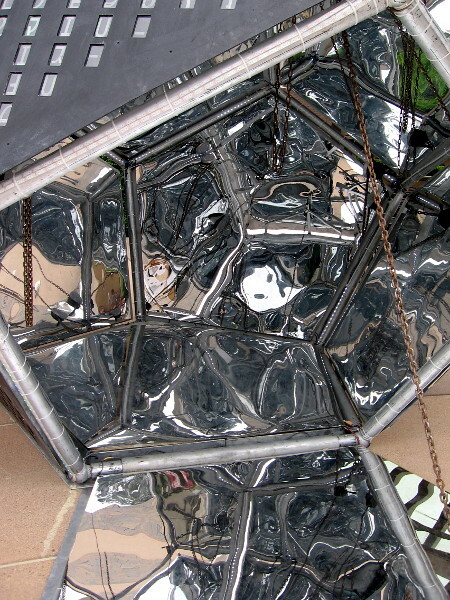 Exterior panels haven’t been attached to this side of the enormous Unfolding Humanity dodecahedron yet. Unfolding Humanity, once completed, will make the mystery of human existence in a beautifully mysterious universe come to life. Posted on August 10, 2018 August 10, 2018 Tags art, burning man, cool, education, math, mysterious, philosophy, public art, san diego, science, sculpture, space, technology, usd1 Comment on Assembling a beautiful mystery: Unfolding Humanity. 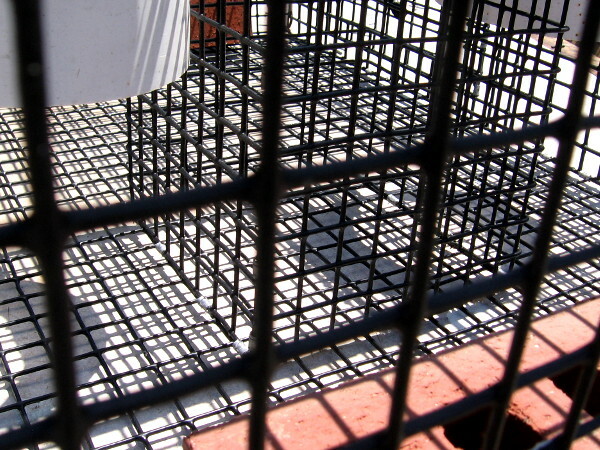 Lobster traps, shadows create a cool matrix. I got some cool photos yesterday when I walked past new lobster traps on a pier. 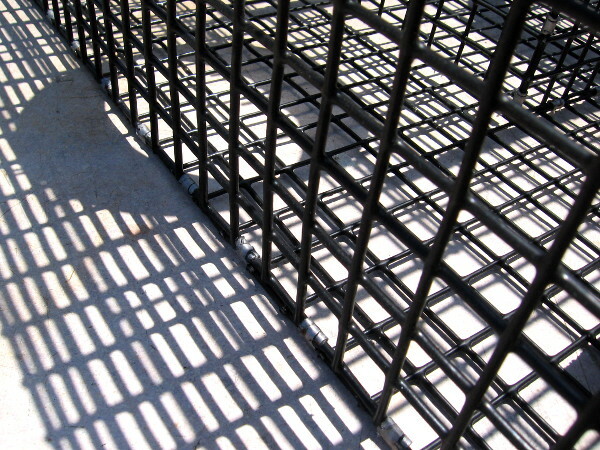 The cage-like traps and their shadows, which were cast on a clean flat surface, created an illusion of strange dimension and space that captured my eye. 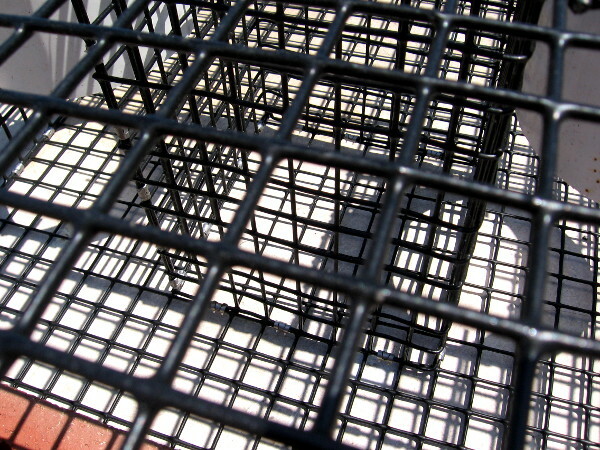 These grids of metal and shadow remind me of some unusual sculptural artwork I recently blogged about in the gallery of San Diego’s Central Library. The following images almost look like molecules arranged in a matrix. 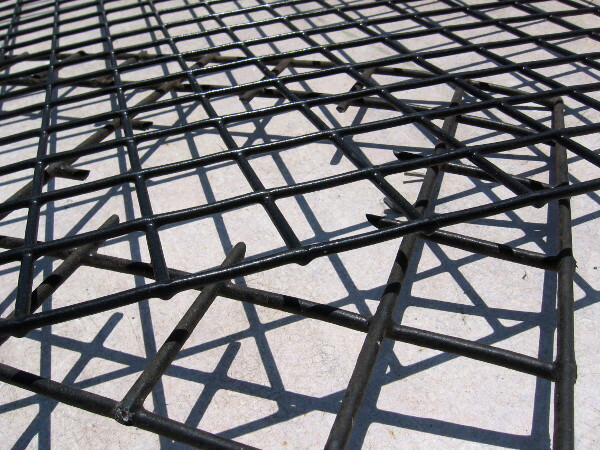 Intersecting parallel lines seem to form an abstract, mathematical, three dimensional space. Life is a stimulating adventure! 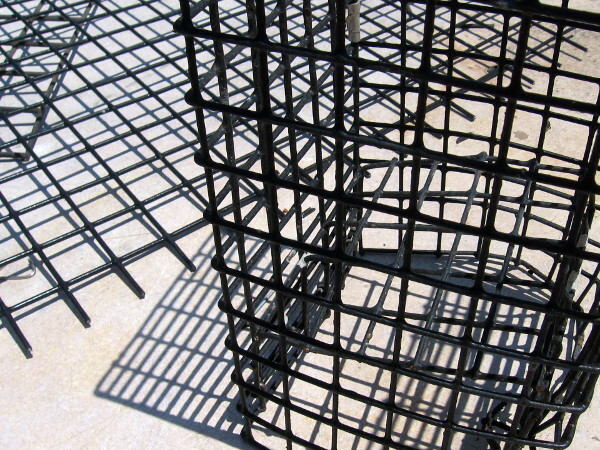 Posted on June 25, 2018 Tags abstract art, cool, lobster traps, math, photography, piers, san diego, sculpture, strange, unusual2 Comments on Lobster traps, shadows create a cool matrix. San Diego students learn STEM through aviation! Cool aircraft are displayed during an event at Gillespie Field by Air Group One of the Commemorative Air Force. Today I headed to Gillespie Field in El Cajon and checked out an Expo organized by Air Group One of the Commemorative Air Force. As I walked among all sorts of restored World War II aircraft and a wide variety of fascinating exhibits, I made a very cool discovery! 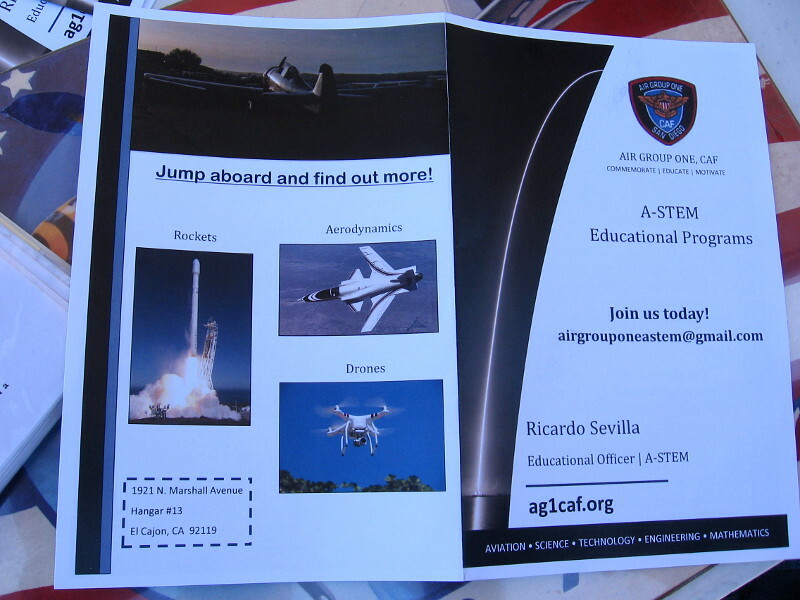 Students in San Diego are invited by Air Group One to participate in a special aviation-themed STEM educational program! The special program is designed for middle and high school aged youth. Ricardo Sevilla, the friendly A-STEM Educational Officer, walked over to introduce himself to me, and I learned a little bit about this truly amazing opportunity. 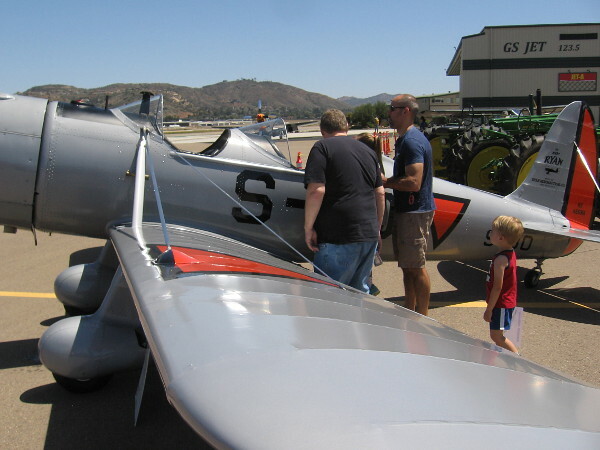 S.T.E.M subjects (science, technology, engineering, and math) can be taught to students in San Diego classrooms or at Air Group One’s super cool Gillespie Field headquarters, where there are a variety of potential hands-on activities. Topics that are featured include how to become a pilot, how to operate a drone, how to build a rocket, and the aerodynamics and design concepts that enable an airplane to fly. Potential careers in aviation and the aerospace industry are also introduced. Sounds like lots of fun! Are you a teacher in San Diego who’d like to learn more? Wouldn’t your students be thrilled to visit an actual airfield? Check out this page of the Air Group One website! 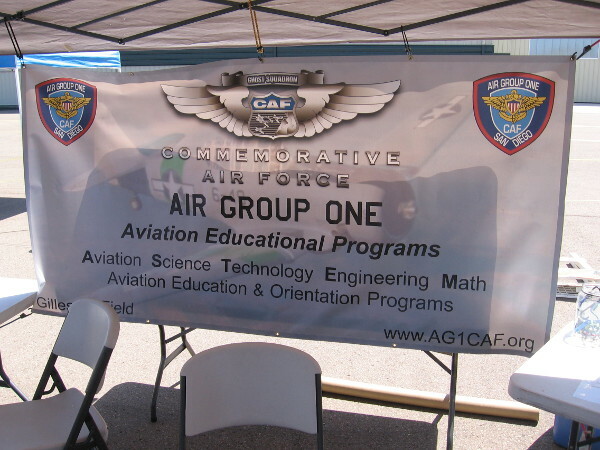 Banner promotes Air Group One’s Aviation Educational Programs. 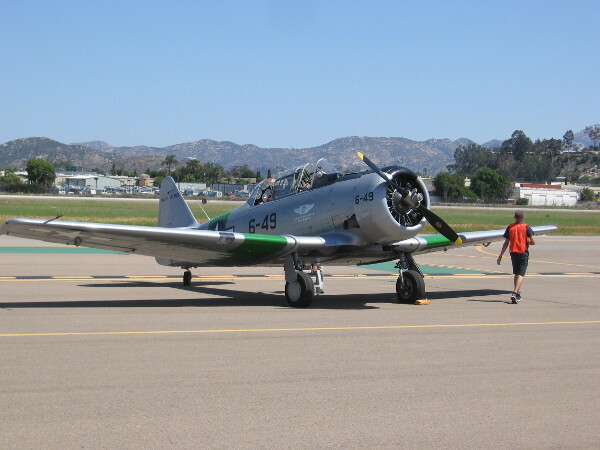 Air Group One’s historic 1943 SNJ-5 “Sassy” on the tarmac at Gillespie Field. 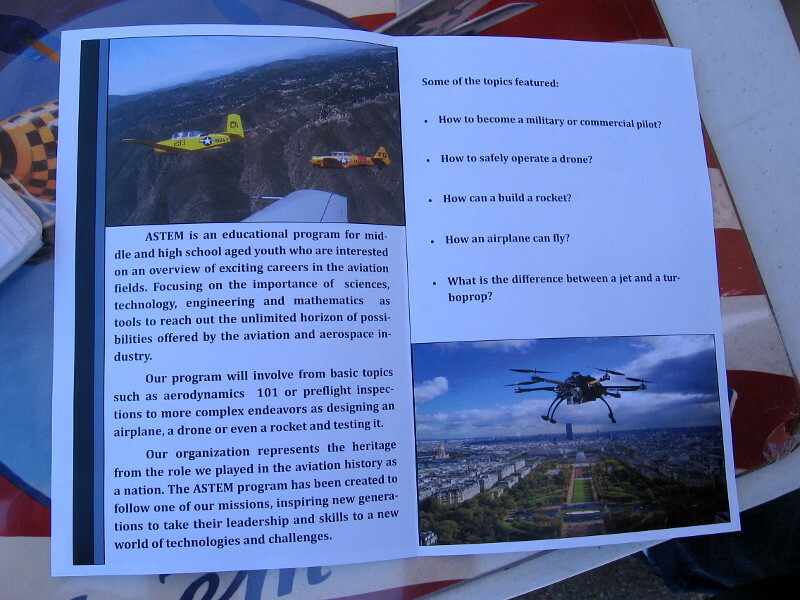 Flyer describes an exciting ASTEM educational program offered by Air Group One. If you’re interested, use the email shown in this photograph. Learning about aviation can help a student take flight and discover new horizons! I’ll be blogging about today’s fantastic event at Gillespie Field as soon as I get my photographs together! 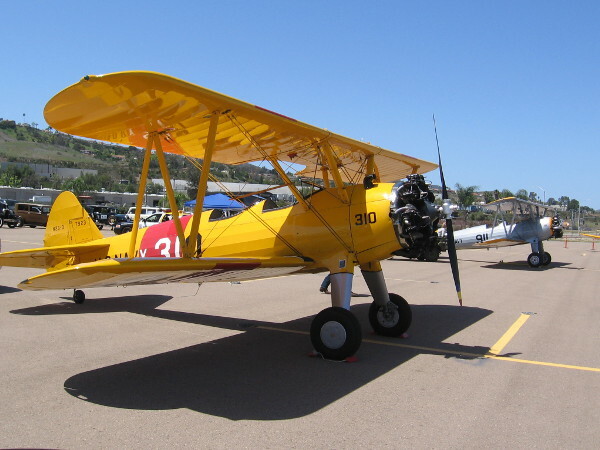 Posted on April 14, 2018 April 14, 2018 Tags airplanes, aviation, cool, education, el cajon, engineering, high school, kids, math, san diego, schools, science, students, technologyLeave a comment on San Diego students learn STEM through aviation! Computer Science and a boom box at UCSD! 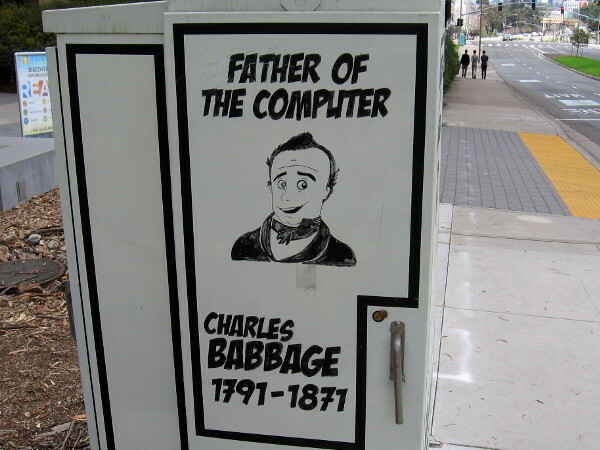 Father of the Computer, Charles Babbage, 1791-1871. 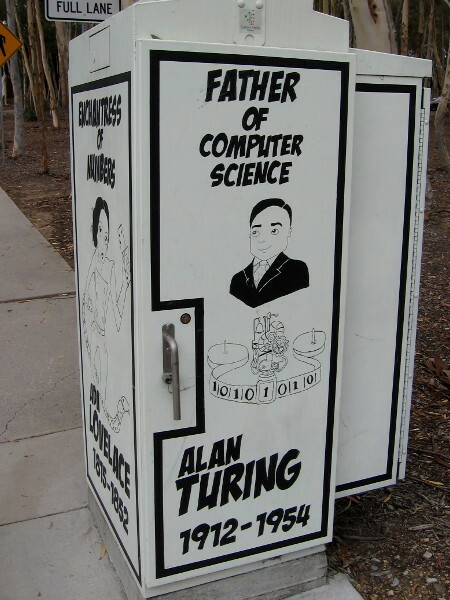 There are two electrical boxes near the UCSD Gilman Transit Center that caught my eye last weekend. One features tributes to three early pioneers of computer science. The other is painted to appear like a gigantic boom box. Technology and music are central to the life of many students at UC San Diego. I always love revisiting the campus of UC San Diego. It’s a very beautiful place, bustling with energy. The university is rated one of the finest in the world. When I see the inventors of tomorrow, walking with smiles in the La Jolla sunshine, I feel hopeful. 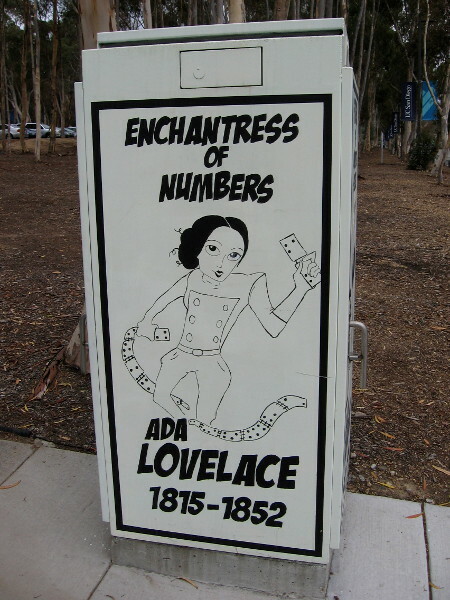 Enchantress of Numbers, Ada Lovelace, 1815-1852. Father of Computer Science, Alan Turing, 1912-1954. 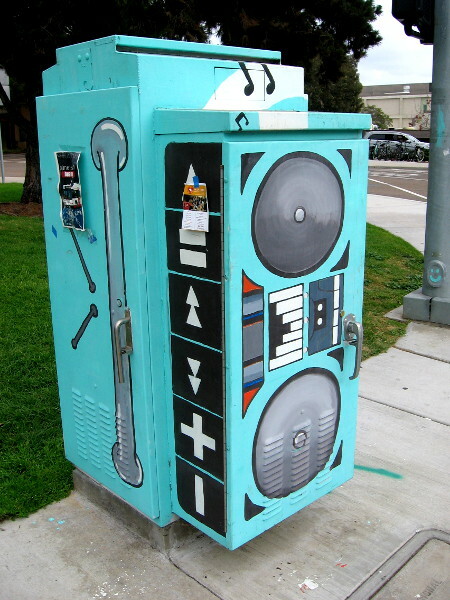 An electrical box painted like a huge boom box near UCSD’s Gilman Transit Center. 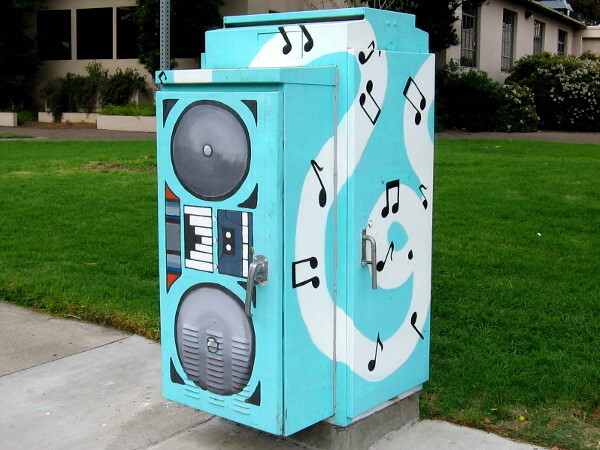 Musical notes stream from an enormous boom box at UC San Diego! Posted on February 13, 2018 Tags art, education, inventions, la jolla, math, music, optimism, photo, san diego, science, street art, students, technology, ucsdLeave a comment on Computer Science and a boom box at UCSD! 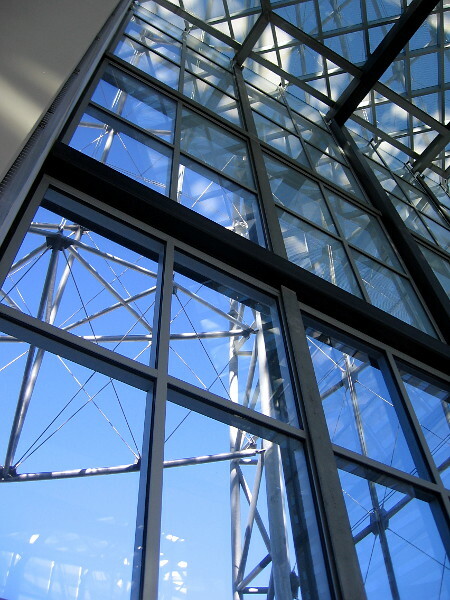 Strange geometry: windows reflected in glass windows. 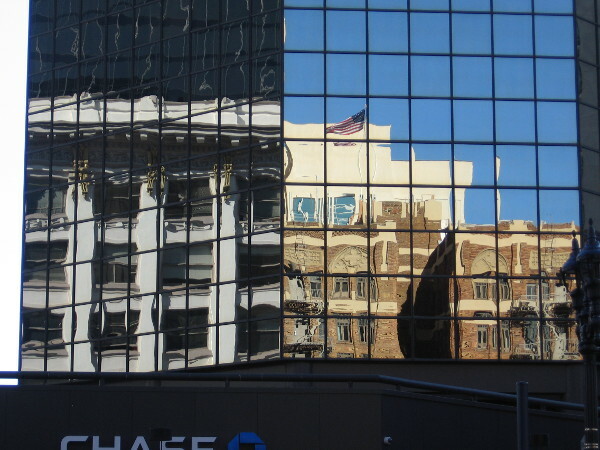 Two different buildings are reflected in the glass windows of 101 W. Broadway. On the left is the Spreckels Theater Building; on the right is the Sofia Hotel. I confess that I love reflections. They often seem magical, like a glowing vision of intermingled dimensions. So I had to take more photos today of windows reflected in glass windows. Walking down Broadway in downtown San Diego is like moving through a funhouse maze. Left and right, the mirrors rise into the sky. One passes through an otherworldly geometry of reflected forms; light dances like the spinning sun upon bright buildings. 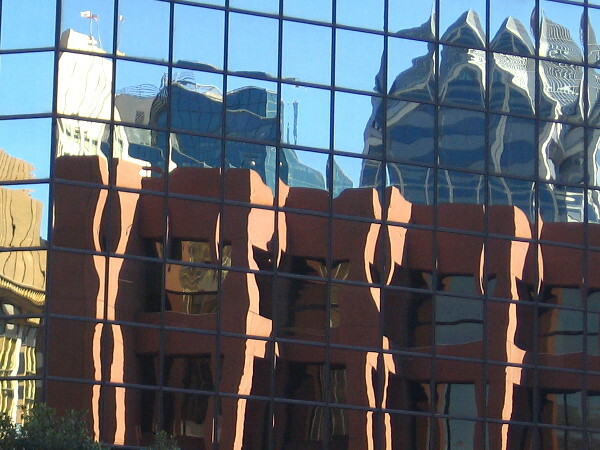 Strangely distorted reflections in the windows of a San Diego high-rise. 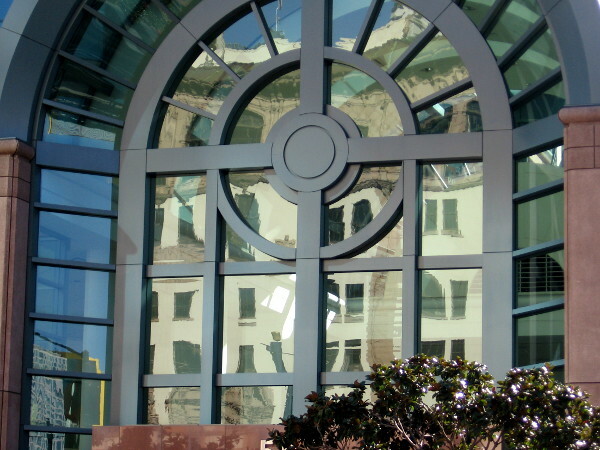 The old Armed Services YMCA building is reflected in the glass windows above the entrance of 501 W. Broadway. 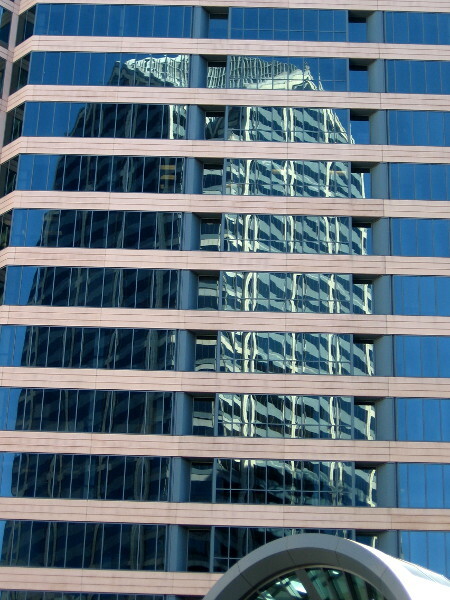 One America Plaza, San Diego’s tallest building, seen in a grid of windows across Broadway. 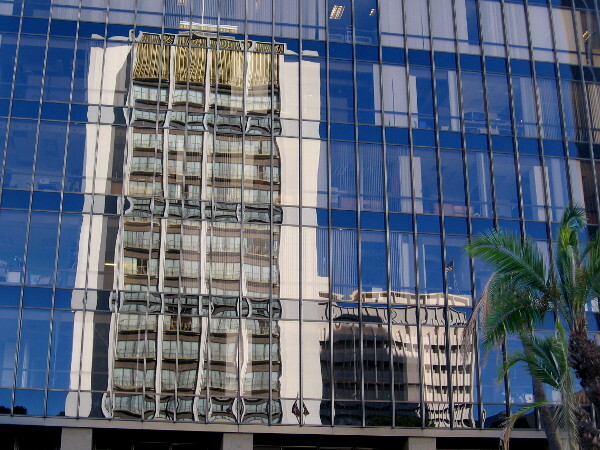 San Diego’s distinctive Emerald Plaza reflected in the windows of 501 W. Broadway. The Westgate Hotel building gleams in the windows of 225 Broadway, the former NBC building. 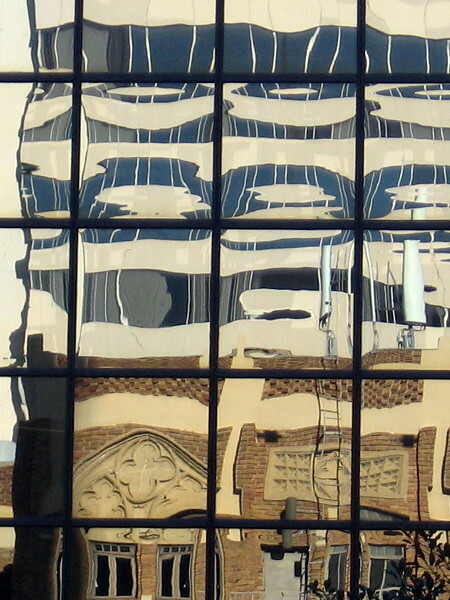 Unusual geometry caused by multiple reflections observed from street level. 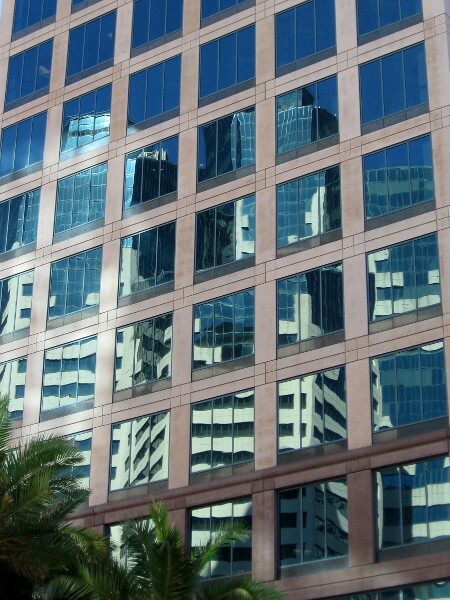 Posted on November 25, 2016 Tags buildings, color, downtown, light, magic, math, photography, reflection, reflections, san diego, strange, streets, walking, windows8 Comments on Strange geometry: windows reflected in glass windows. Reflection, geometry, complexity. One iconic dome. Photo of a unique downtown landmark. 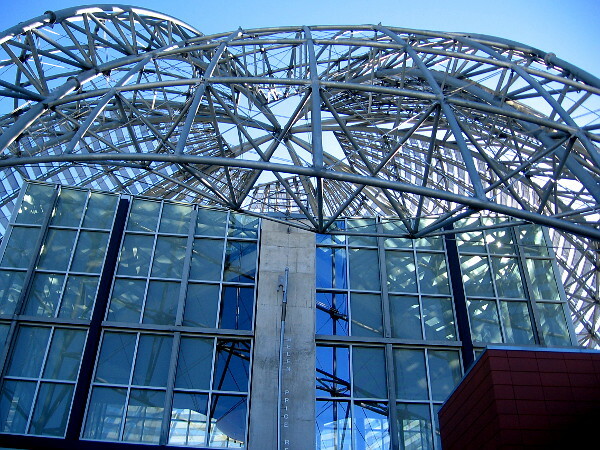 The shining lattice dome of the San Diego Central Library, as seen from the ninth floor’s outside deck. Many old redundant photos are being purged from my computer this weekend. But I had to definitely share these! 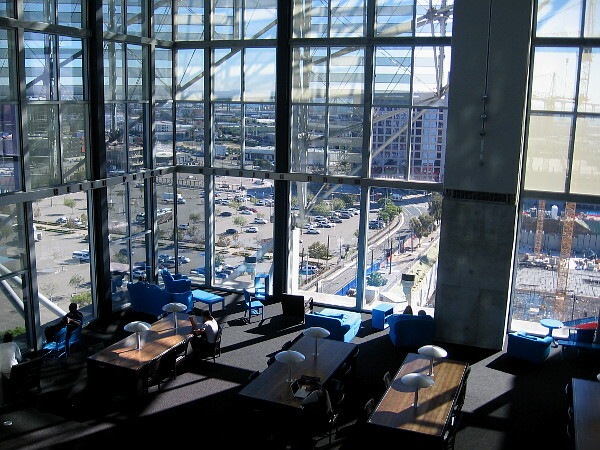 I’ve blogged about San Diego’s relatively new downtown library several times. I’ve posted more than a few pics of its unique lattice dome. You might recall some weirdly halo-like photos I took in the darkness early one night last year. Well, check these out! The curving lines of steel reflected in the building’s windows look like a lesson in complex geometry. You know, in a strange way the dome reminds me of a graph or diagram demonstrating how time and space can be warped by gravity! Am I crazy? What does it look like to you? 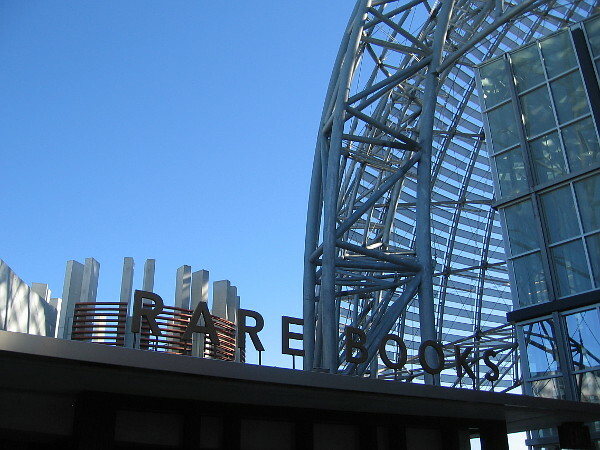 A collection of rare books is housed in a room on the ninth floor of San Diego’s public library. 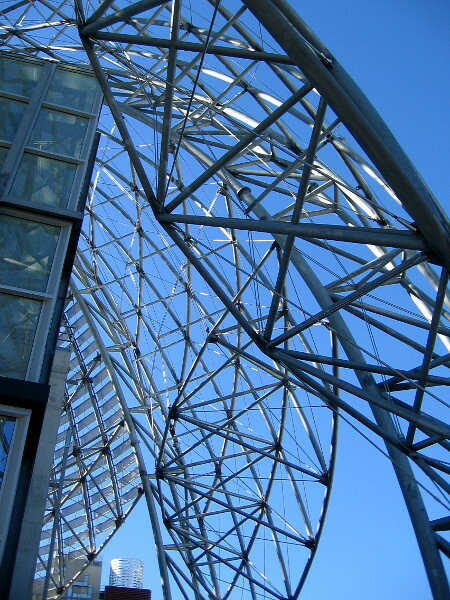 The visually impressive steel lattice dome tops an airy two-story high library reading room. An architectural marvel. Reflections in the windows create a fantastic, mysterious image. Looking upward at the metal dome and blue sky. Amazing views can be had of downtown from the library’s ninth floor. Lots of geometric complexity and dazzling light for my camera’s lens. Peering down into the spacious reading room on a bright sunshiny day. 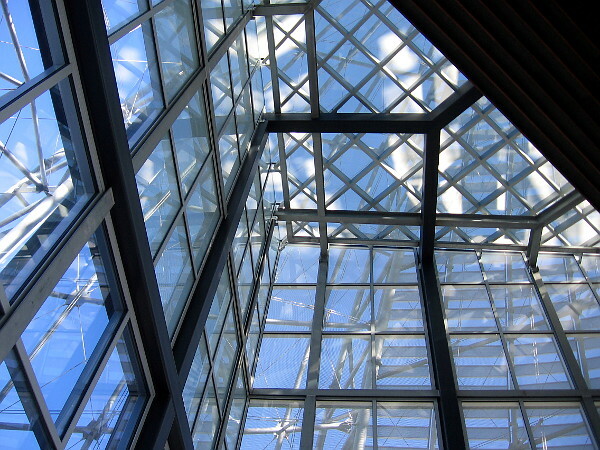 Filtered light and shadows form unusual grid-like patterns inside the reading room. The perfect place to study a math book, maybe. A three-dimensional delight. 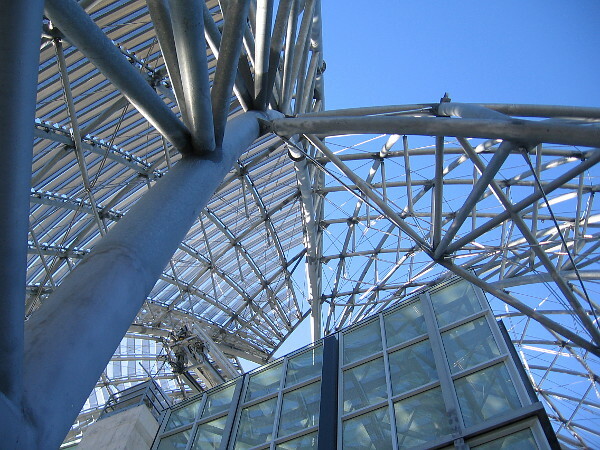 Intersecting lines fascinate the eye. One last cool photo. I feel like I’m floating through some sort of mathematical dreamscape. Do you like to read short pieces of thought-provoking fiction? You might enjoy checking out Short Stories by Richard. 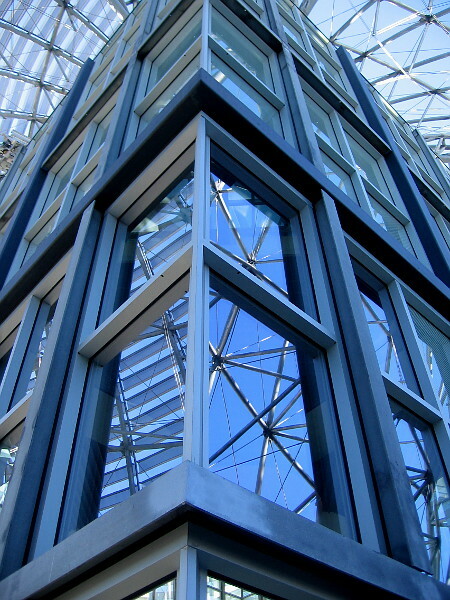 Posted on March 20, 2016 Tags amazing, architecture, buildings, cool, downtown, landmarks, libraries, math, photography, reflections, san diego, san diego library, unusual, windows16 Comments on Reflection, geometry, complexity. One iconic dome.